To enter any tournament register on the USSSA website. For details of each event scroll to the end of the page and click the tournament link. Teams receive a dedicated and scheduled warmup batting cage for hitting, throwing prior to each game. Trophies for 1st and 2nd place. 2-day tournaments (Fall and Spring Classic) take 6 teams with 4 game guarantee with 3 game pool play and single elimination. 1-day tournaments (Holiday and Midnight Madness) take 5 teams with 3 game guarantee with 2 game pool play and single elimination. All tournaments at FPN are Stay-to-Play for those needing hotels. All teams needing hotels must book their hotels through the Connecticut Convention & Sports Bureau website they made especially for our tournaments. For more info about the Stay-to-Play Policy and to book your hotels, Click Here. 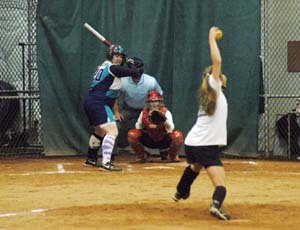 Fall and Spring Classic are standard 2-day weekend tournaments. 4 game guarantee, 3 pool into single elimination. Field limited to 6 teams. Midnight Madness are overnight tournaments that start Sat. night at 10pm and end 8am on Sun. morning. 3 game guarantee, 2 pool into single elimination. Unlimited use of all batting cages and pitching lanes. Field limited to 5 teams. Bring your team, your sleeping bag, a pillow and a midnight snack. Parents are optional. It's like a slumber party with softball! Holiday Tournaments are 1 day only. Read More to see the list of Outdoor USSSA Tournaments at FPN Park.